Chapter 6 presents another excellent example of really interesting history on how the Chinese Communist Party set out to re-shape Buddhist doctrine to get practicing Buddhists to follow the party line and willingly enlist with the Red Army to help defend Korea from the Americans. In other words, it’s another example of fine scholarship that contradicts what the editors of this collection assert – that Buddhism rationalizes violent action and warfare – by clearly showing that Buddhists succumbed to the pressures of the prevailing hegemony either through acquiescence or through intentional action to curry political favor. 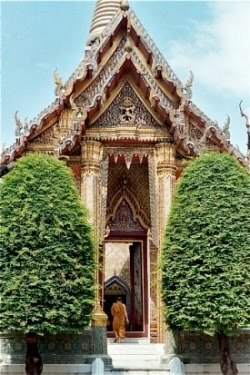 Buddhists in China at this time didn’t become soldiers because Buddhist doctrine condoned it; rather, the Chinese Communist Party beguiled Chinese Buddhists into believing that by helping the North Koreans defend themselves from American forces, they would be practicing the Bodhisattva path. This was a clever ruse by the Chinese Communist Party achieved by co-opting Buddhist terms and concepts and re-packaging them in terms that would benefit the party. And in part, it was also a reaction by Buddhists there to secure preservation of their practice under the Communist regime. The results of these efforts can still be witnessed in China today as the Party prepares for its 90th anniversary, as evidenced by this article. By using the language of the bodhisattva, the pure and good intention of the Chinese and efforts to support the underdog Korea were made palpable to a Buddhist constituency. Never mind that it was the North Koreans who started everything by invading the South and that America only ventured into the fray following the North’s aggression and near occupation of Seoul. This chapter, “Buddhists in China during the Korean War,” is an excellent read and bit of history. But as an article to support the editors’ thesis that Buddhism in and of itself it “warlike?” Sorry, not a chance. Please don't forget to visit and "Like" the My Buddha is Pink Facebook page! I'm a painter and my passion is to spread love and happiness through my artworks. I also have Buddha paintings which I hope would bring a feeling of serenity. Concerning your post of May 16th on Buddhism and war, I really think Victoria’s statement about ‘Buddhism’s historic proclivity to condone war’ should be corrected to ‘Japanese Buddhism’s historic…etc’. My reading of South Asian and SE Asian history is that these cultures have had as many wars as other cultures, but the Dhamma has rarely been dragged in to justify them. See my www.buddhisma2z.com under War and on the ‘self, no self’ issue see Anatta and Rebirth and Self. Thanks for sharing that link Bhante. I particularly like your point that war, or any aggression, does not spontaneously erupt, that there are causes and conditions that precede the outbreak of war. I think too many of us forget that. How about Jerryson's "Buddhist Fury: Religion and Violence in Southern Thailand"? How about Tambiah's Buddhism Betrayed?